Earlier in the afternoon, we had made a courtesy call to Consul General Blesila C. Cabrera at the Philippine Consulate General along North Michigan Avenue. During the reception, I was expecting Philippine cultural performances but there was none of that. Maybe next year, they can include that in the program since the current generation of Filipinos in the U.S. are no longer familiar with our culture having been born and raised there. It would be great if they can bring in cultural groups from the Philippines to perform or even better if young Filipinos in the U.S. can practice and perform our traditional songs and dances themselves. What I noticed though was that there were so many ladies wearing crowns and sashes on the stage and even right below the stage. I know that traditional Philippine fiestas involve naming a queen and princess. But it's usually one for each. So we asked why there were so many ladies wearing crowns and sashes. The answer was each Filipino association had its own queen! Then I realized, the Filipino-American community in the U.S. is an agglomeration of ethnic associations reflecting the regionalism that exists here in the Philippines. 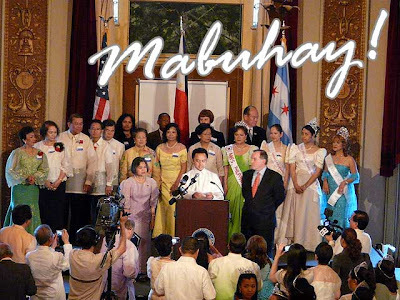 In general, we were told that Filipinos in the U.S. form associations based primarily on their place of origin in the Philippines rather than forming a single heterogeneous community based on their geographical location in America. We were told it partly explains why we don't have any "Filipinotowns" in the U.S. aside from the fact that we are good at adjusting to any culture to begin with. Filipino-Americans are in the best position to set an example for our country by going beyond the regions, provinces and towns, transcending cultural barriers and moving as one. Filipinos here and around the globe must unite, strengthen Philippine national (and not just regional) identity and move our nation forward.